As previously mentioned, I’ve been looking through an old faded 1970s scrapbook, compiled when I was about eight years old. Within its old pages I’ve rediscovered what could be seen as a prototype of this website … or maybe not. But I did find it quite funny. Feel free to laugh at my rubbish drawings. The 1970s scrapbook version shows clearly that at the time I’d been heavily influenced by the exhibitions at the St Mary’s Heritage Centre, circa 1975-6. 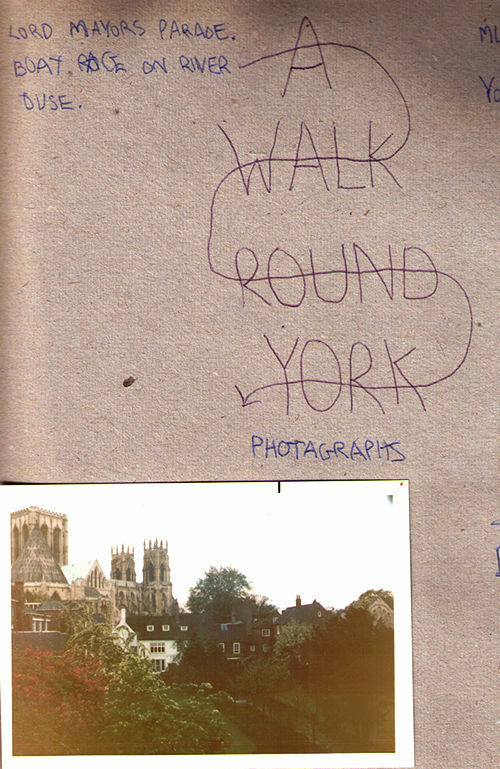 The design from the Heritage Centre leaflet, a logo for ‘A Walk Round York’, is once again copied, and the following pages appear to be an attempt to catalogue various bits of York for some kind of readership, who are given instructions as to what PTO stands for (rather dim of me, as most people understand the concept of a scrapbook and would expect to have to turn the pages, but still). Readers are clearly envisaged as being keen to see my next contribution, as promises of future content are made. It’s rather bigged up – with YORK MINSTER being promised, but only achieves about 3 pages of content before I got to the last page, whereupon it appears to have been entirely abandoned. 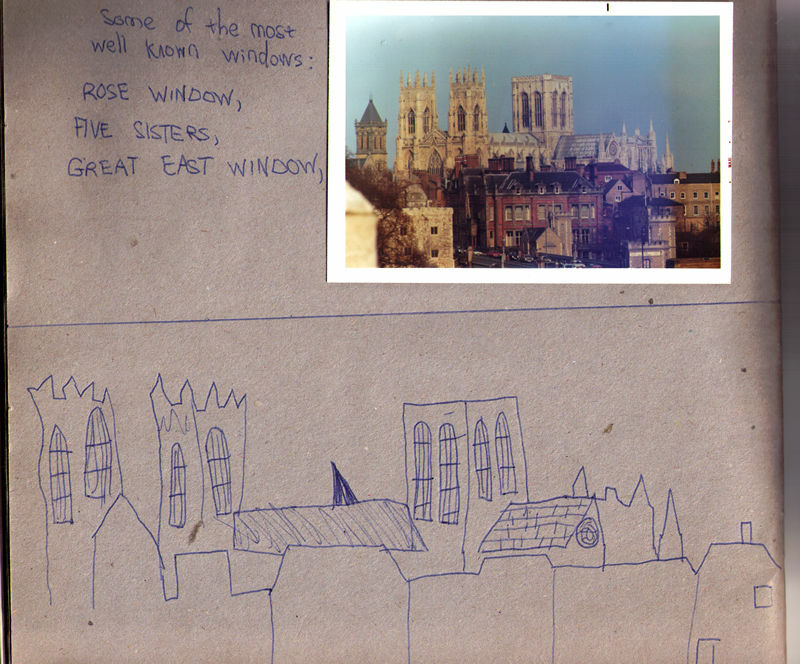 I present a few key facts about York Minster, copied from somewhere, and include a photo taken by my dad, of York Minster across the rooftops. 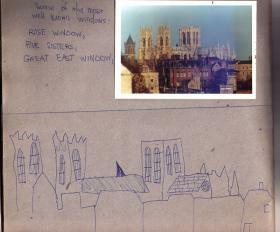 Also included is a rubbish drawing, which is clearly an attempt to copy the photo. 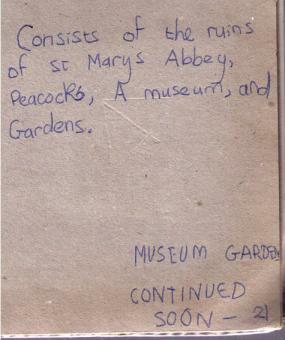 There’s also a page on the MUSEUM GARDENS, as proudly proclaimed in blue biro on yellowing old paper stuck down with even more yellowing sellotape. 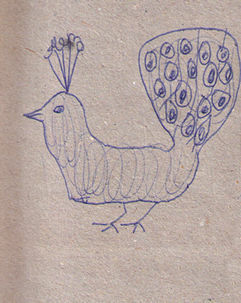 It includes photos of the hospitium (by my dad), with big gaps where there must have been other photos – which perhaps fell out in the intervening years after their sellotape gave out – and this drawing of a peacock. 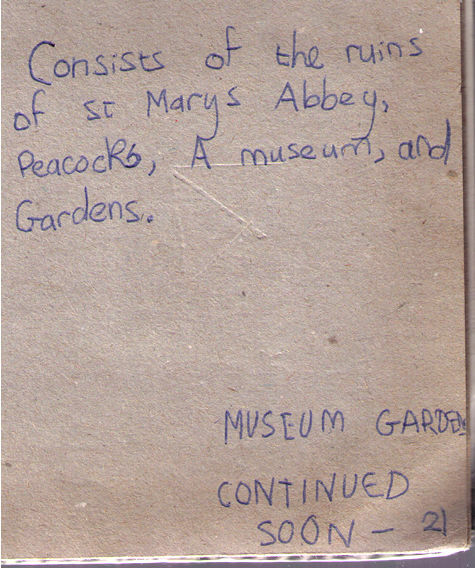 ‘Consists of the ruins of St Mary’s Abbey, Peacocks, A museum, and Gardens’. It took me almost exactly 30 years, but this story was continued, and later expanded upon. 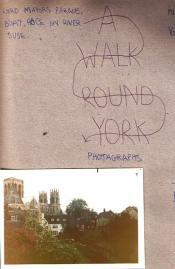 Thankfully in the intervening years I learned a few more words, and how to spell the word ‘Photagraphs’ properly. If you’d like to know what peacocks really looked like, and don’t believe they used to wander about in the middle of town, there’s a photo here, of a Museum Gardens peacock on nearby St Leonard’s place. Fantastic stuff as always – loving the peacock drawing! your ‘pithy’ summary of the Museum Gardens made me laugh out loud… what more would the current twitter generation need? Drake, they did wander, didn’t they, and occasionally stopped the traffic on Museum St, while walking across ever-so-slowly.